Did ultra-nationalist locals burn down the hotspot, was it the migrants themselves who did it, or was it the result of agent provocateur actions? 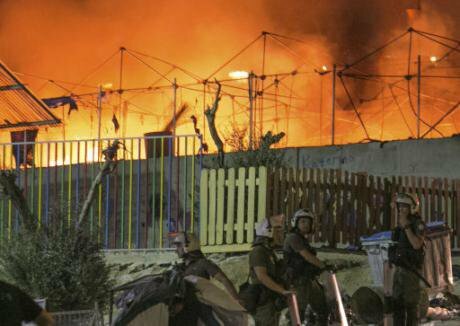 Riot police stand guard as a large fire burns inside the Moria refugee camp on the northeastern Greek island of Lesbos, September 19, 2016.Michael Schwarz/Press Association. All rights reserved.Nothing but burnt rubble remains in a large part of Moria on the island of Lesbos. The infamous EU hotspot – aka detention centre – that so many had hoped to see vanish from the discourse of migration, has now ended up physically going up in flames instead.